View Contest Information for the most recent updates. Click here for scorecard information for milk and other dairy products. 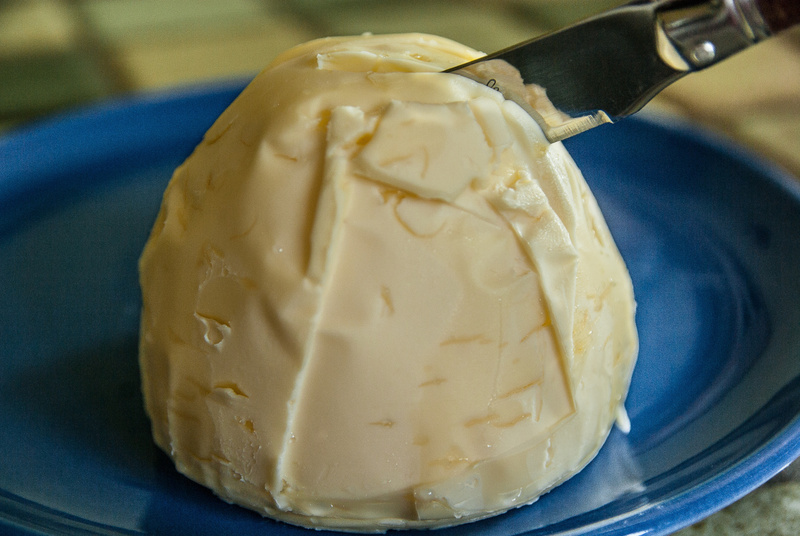 Butter is just one of six dairy product categories to be judged. What is the CDPEC (Collegiate Dairy Products Evaluation Contest)? The Contest represents the culmination of student training by college professors who are experts in dairy product evaluation. A group of industry experts select the six products to be judged in each of the six categories, and they evaluate them using the same attributes and scoring values taught by the coaches. The six dairy products that are evaluated include 2% fluid milk, butter, cheddar cheese, vanilla ice cream, cottage cheese, and strawberry-flavored Swiss-style yogurt. During the competition, the students utilize their method honed sensory skills and standardized scorecards to evaluate the quality of and score the products. Teams and individuals that score closest to the expert evaluations are honored with awards. The Contest has come a long way since its initiation in 1916, when it was known as the "Students Butter Judging Contest." Through World War I and II, the Collegiate Dairy Products Evaluation Contest has had a phenomenal record of growth and industry participation. Dairy industry companies support the contest by donating and storing contest samples, as well as provide proctors, scorers and official judges. "The uniqueness of the Contest is that all participants benefit. Even those team members not receiving awards or prizes benefit because they gain knowledge about the quality of dairy products and how to critically evaluate them. The team members enjoy a special experience in competition and associating with rival students from other colleges; experiencing the paramount international food exposition or a tour of a food processing facility ... and meeting industry leaders who are dedicated to the art and science of producing the best dairy products in the world. The successes of contest team member alumni are the strongest evidence that those who put forth the extra effort required to train and compete are "the cream of the crop." Many have risen to top corporate positions or have become the leading academics in the world. Appreciation for the variety of sensory attributes that characterize dairy foods. Knowledge of the sensory properties that can be modified within dairy foods. Abilities to identify specific defects and to relate them to causative factors. Improved ability to make decisions quickly and to know why the decisions were made. Insights into who and what constitute the dairy and food industry. Provides employees skilled in sensory evaluation, knowledgeable in interpreting its results, and instilled with a desirable sense of professional discipline. Recognition of the dairy industry as a career opportunity in students who might otherwise not be aware of it. Who can participate, where, and how? Undergraduate or graduate students from a land grant, state, or provincial agricultural college, or two year agricultural colleges are eligible. Students can only compete in one national contest. Each team can be comprised of a maximum of three undergraduates, two graduates, and two alternates. The Contest has traditionally occurred in the fall and has previously been located in US cities from coast to coast as well as international locations such as Montreal or Toronto. In some cases, the contest has even coincided with dairy industry trade shows. The time commitment involved, outside of the student training with the professor, is typically a three day weekend. Day one is travel to the contest and coaches meeting, day two is the contest and awards, and day three is return travel. Teams must be pre-entered to participate in the competition. Individual and team awards are available for each of the six product categories evaluated. Some product categories also have monetary awards too! If you would like to support the Collegiate Dairy Products Evaluation Contest please click on the Sponsor Tab to find all of the opportunities for contest sponsorships for companies, organizations or individuals. If you would like to network with other contest enthusiasts click on the Alumni Tab to join a network of contest Alumni, Coaches, Judges or Friends.